AshampooÂ® PDF Business takes care of any PDF issues your company ever had and gives you the tools to be more productive and flexible when you’re working with PDF documents. Aside from viewing and creating PDFs, particular emphasis has been placed on document editing which is as simple as editing text in your favorite word processor. Convert your documents into common formats such as Word, fill out forms with the help of program assistants or protect your valuable work with powerful 128-bit encryption. Whether it’s text recognition in 26 languages, joint document editing or obfuscating sensible text passages, AshampooÂ® PDF Business gets the job done in a professional manner. Always! With Ashampoo PDF, creating, editing and annotating PDF documents becomes just as easy as exporting them for further processing in Microsoft Word or other applications. Ashampoo PDF always delivers excellent results – whether you’re working with text and images, replace fonts, modify layouts or rearrange the pages in a document. 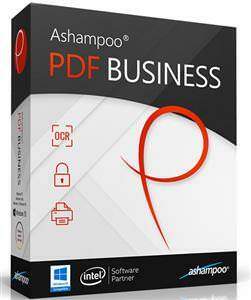 Ashampoo PDF can create high-quality PDFs from any Windows application. Simply click “Print” and select the included Ashampoo PDF virtual printer. If size matters, Ashampoo PDF can automatically downsample images, e.g. to facilitate online publishing. Ashampoo PDF makes it easy to add comments to PDF documents, illustrate important details and highlight individual passages with the marker tool. It also comes with ready-to-use stamps like “Approved!” or “Confidential!”.